Costa will expand their “slow cruising” program to include a third ship, Costa Classica. The 51,000-ton ship will join the program after an extensive refit this fall, when it will be renamed Costa neoClassica. Several lines have finally decided to pull the plug in the Black Sea. No, that doesn’t mean Black Sea drained; it means they are they have decided Ukranian (or former Ukranian) ports aren’t the place to take tourists right now. Other lines are still mulling over the situation. month at Grand Bahama Shipyard. MSC Cruises signed a letter of intent today with STX Europe to build two 167,600-ton ships, with an option for two more. The ships will be a new design and the largest ever built for a European owner. CND subscribers also read about cutting up in Papenburg ... and the thrill of adventure. The first steel cut by Meyer Werft for Norwegian Escape. Note the fancy commemorative cut. MSC Cruises has signed a letter of intent for STX Europe to build two 167,600-ton vessels for delivery in 2017 and 2019. The ships will carry 4,500 passengers in double occupancy, up to a total capacity of 5,700 passengers, along with 1,536 crew members. The contract will also include options for two additional ships to be built later. Construction is scheduled to begin in the spring of 2015 at the STX yard in Saint-Nazaire, France. Complete details will be in today's edition of Cruise News Daily. Royal Caribbean International has opened the books on three ships operating their seven-day product from Florida to the Caribbean for the 2015/2016 winter season, and it appears that customers will have a choice of sizes of vessel: big and bigger. * He’s Coming! He’s Coming! If you are a friend of a celebrity (or superstar), he may have been to your house occasionally, but if you ask him to your birthday party, you’re never sure if he will be able to accept your invitation or not. On the occasions he does, you’re really excited. Cunard has much the same relationship with the Royal Family. For that reason, Cunard was very pleased today to announce that The Duke of Edinburgh will join them aboard Queen Mary 2 to celebrate the ship’s tenth anniversary. Steiner Leisure, the operator of spas on 155 cruise ships, has announced they have extended their agreement with Azamara Club Cruises through December 2017. This news gives some interesting indication about an earlier Steiner news story. 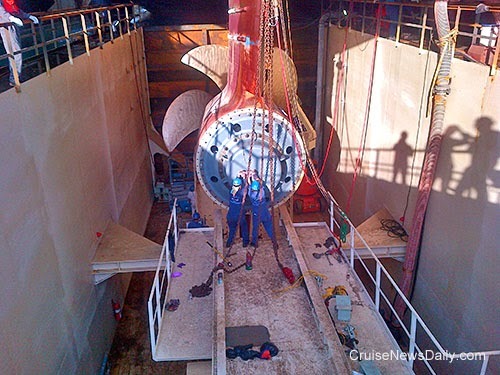 CND subscribers also read about a Guinness record with some perspective ... pound for pound it's money well spent ... and the site for ship enthusiasts with a "special interest." MIAMI (March 18, 2014) — Carnival Cruise Lines has named Dolores L. Calicchio vice president - shipboard human resources, effective March 31, 2014. Calicchio will report to Ruben Rodriguez, Carnival’s executive vice president - ship operations. Calicchio will be responsible for developing, integrating and managing the cruise line’s core human resource strategy and functions for all shipboard hotel and marine personnel across Carnival’s 24-ship fleet. In addition, she will oversee the line’s recruiting efforts, crew training and certification, and compensation, benefits, and crew welfare programs. In collaboration with the ship operations team, Calicchio also will oversee the continuing development of the Carnival Service Values fleetwide hospitality training program, as well as reinforce the line’s culture of safety and reliability. Calicchio brings 15 years of senior-level experience to her new position. Most recently she was chief people officer at BAYADA Home Health Care, an $850 million, privately held home health care company with 22,000 employees. Prior to that, she worked at Johnson & Johnson Health Care Systems for 10 years, most recently as vice president - human resources. Calicchio also held top management positions at several large pharmaceutical companies, including Rhone-Poulenc Inc. and Merck & Company Inc.
Calicchio served as the human resources chair for the United Way of Somerset County, N.J., as well as for The National GEM Consortium, a non-profit organization sponsored by Notre Dame University which raises funds for minority students pursuing higher education in math and science. Calicchio holds a bachelor of science in biology from Kean College in New Jersey and a master of business in human resources leadership, education and technology from New York University. FORT LAUDERDALE, FL. (March 18, 2014) – MSC Cruises has appointed Elizabeth Lindsley Elwood as the manager of Corporate & Incentive Sales for North America, a newly created position for the line. She will use her extensive cruise industry and corporate sales experience to grow the company’s incentive and meeting business within the meeting, incentive, conference and exhibition (MICE) distribution channel as well as the corporate direct marketplace. “We are extremely excited to have Elizabeth join our growing sales team at a time when MSC is establishing a strong presence as a year-round operator in North America with intentions to grow capacity in the coming years. Our current twelve-ship fleet offers outstanding state-of-the-art hardware for large meetings, incentive trips and custom charters along with a touch of Mediterranean spirit in everything we do and everywhere we go,” said Ken Muskat, senior vice president of Sales & Marketing for MSC Cruises. “Building relationships and awareness of MSC with corporate and incentive clients as well as developing strong ties with meeting and third-party travel partners is a strategic goal of MSC and we are honored Elizabeth will be working with us to make this happen,” he continued. Elwood brings to MSC Cruises more than 30 years of sales, customer service and marketing experience in the global cruise and airline industries. Most recently, she was with Celebrity Cruises as Corporate Sales Manager where she established preferred partnerships, exceeded goals regularly and was continuously recognized for her achievements. Her prior experience also includes Royal Caribbean International, as manager of Corporate & Incentive Sales, Holland America Line Westours, and Windstar Cruises where she served as a District Sales Manager, and Northwest Airlines where she held a variety of progressively responsible roles. Last week Norwegian Cruise Line announced that Norwegian Escape would be positioned in Miami for a seven-night eastern Caribbean program. Next week, the line will open it for sale, and next month, they will open the rest of their Caribbean program for the winter 2015/2016 season. We told you that the line’s goal has been to have two large ships in the South Florida to the Caribbean market, but while they’ve been attaining that goal, they have had their other purpose-built Freestyle ships in the Caribbean sailing from New York and the Southeast where they could be top of the line. Now that they have the large ships in South Florida, they’re not forgetting those other Southeastern markets. CND subscribers also read about how they did it (more) ... Venice is open again ... and as promised. A few days ago we showed you some dramatic pictures of Queen Mary's master, Captain Kevin Oprey, standing under the bow of Queen Mary 2 while the ship was out at sea. In this video, Cunard shows us how they did it.